Back in the day, multinational corporations like Cadbury dominated the Easter egg market in the UK, turning their standard chocolate bars into hollowed out eggs each spring. Thankfully, times have moved on. Today, a combination of passion, care and craftsmanship goes into honing the perfect Easter egg – from the percentage of dark to milk chocolate, to the patterning and colouring of the egg’s shell, to the intricately-designed, sumptuously-filled treats hiding inside. Not only do Easter eggs come in all shapes and sizes, there are now vegan Easter eggs, sustainably-packaged Easter eggs, gourmet Easter eggs and eggs that could win awards for the complexity of their architectural structuring. Having sampled our way through the offering from several supermarket chains, high street chocolate shops and independent chocolatiers, we bring you our take on the best Easter eggs of 2019. Here’s a fun fact for the dairy-free among you: Booja Booja’s Dairy-free Almond Salted Caramel Truffles (£6.99) taste exactly the same as their dairy equivalents. Rich, sophisticated and texturely pleasing, these truffles are our pick of the dairy-free offering. Oh, and forget chocolate eggs: Booja Booja sells their delectable truffles in hand-painted, egg-shaped boxes which are made in India and hand-packaged in Norfolk. They’re a little more expensive (£9.99 for a small egg and £24.99 for a large) but make for a gorgeous Easter keepsake. Oh, Hotel Chocolat, you reliable high street chain upping the quality, taste and originality of chocolate across the country. This year, the brand's Easter egg haul comes in all shapes and sizes, stretching the convention of what Easter chocolate should look like. We loved the Cookie Dough & Ice Cream Sandwich. With its creamy, raspberry-meets-Madagascan-vanilla infusion, it’s a great one for sweet-toothed kids (although its sandwich shape bears questionable relevance to Easter). The Quails Eggs (£12), meanwhile, are our Easter dinner party pick. Small, sophisticated, and delicately designed, these mini eggs look and taste gourmet, and provide a refined alternative to smashing a large, sharing egg with your fist – raising the eyebrows of fellow guests at the dinner table. The Quails Eggs come in a sustainable, biodegradable egg box, too, making them a planet-friendly, plastic-free alternative. Hotel Chocolat’s gift-to-impress is, undoubtedly the Ostrich Egg (£80). It’s giant – you’ll be hard-pushed to find a bigger egg on the market – weighs over a kilo, and is studded with cookies and puffed rice. The Ostrich Egg comes in dark or milk chocolate, swaddled in paper straw (don’t forget to dig around for bonus vanilla-filled mini eggs) and topped with one of the brand’s signature trays of assorted chocolates – making this the Easter gift that keeps on giving. 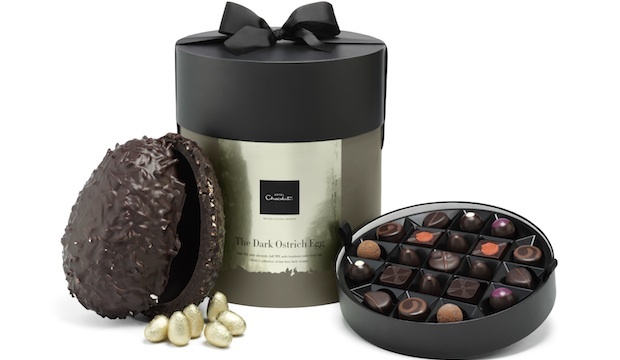 That said, our favourite of Hotel Chocolat’s Easter offering is the ‘You Crack Me Up’ Egg (£27). Its thick chocolate shell comes in two halves – one of which is caramel and white chocolate, the other 40% milk. Each half houses an assortment of funny faced chocolates filled with either vanilla, caramel or praline. In short, all who tried it in our office gave the egg full marks on both taste and appearance. Did you know that M&S has a dedicated Easter Egg Developer? Her name is Katy Patino and she’s been working on the reliable supermarket chain’s offering for the last year. Her favourite? The returning Prosecco Egg (£5) – milk chocolate infused with raspberry, blackcurrant and prosecco. We, at Culture Whisper, weren’t so sure about the Prosecco Egg; it’s bizarrely fizzy and, as one team member pointed out, ‘it tastes like a hen party’. That said, it’s a fun novelty. Just be warned: the residue of its pink, shimmering shell will end up all over your hands. Meanwhile, those who believe size matters should look to the towering, angular Colosseum Egg (£15). The Belgian milk chocolate comes dusted in gold and with a cluster of hazelnut praline-filled truffles thrown in for good measure. Or, for more refined fare, look to the Hand-Decorated Dark Chocolate Feather Egg (£15). It’s a little bitter but, with its delicate patterning and rich, caramel-filled mini eggs, it’ll impress discerning chocolate lovers. Waitrose stocks a range of own-brand eggs as well as those of other brands, between which everything from vegan and free-from to luxury chocolate is covered. But let’s be honest, the one that really turns heads is, of course, the Avocado Egg. (No, it’s not actually avocado flavoured. It just looks like half an avocado with its Belgian chocolate shell, white chocolate flesh and cocoa-dusted ‘stone’ still nestled in its core.) Mirroring the avocado zeitgeist that’s swept across the nation over the past few years, it became the supermarket’s fastest-selling Easter egg ever when it launched last year. Unfortunately, while the Avocado Egg certainly looks the part, it tastes not nearly as playful as it looks. The majority of the egg is made up of chocolate that's dark with a capital ‘D’, while the sweeter taste of the white (naturally dyed green) chocolate barely penetrates through the dark chocolate it sits upon. Do buy the Avocado Egg for its appearance, but gift it only to someone with a penchant for serious cocoa. The 2019 Easter egg from Paul a. young. Paul. a. Young delights visually this year with a moderately-sized egg dusted in shimmery metallics. Despite the shell of the egg being thick (a definite bonus), the chocolate itself could have been richer. The caramelised chocolate chicks, on the other hand, were deliciously creamy and dense – a mercy given they proved so moreish. The egg also comes with a handful of dense, nostalgic-looking chocolates, coated in part by a layer of sprinkles. Moo Free fills a serious gap in the market. The brand’s eggs are dairy free, gluten free and soya free. But far from tasting like cardboard or bitter cocoa – as free-from eggs are prone to do – these eggs are sweet and caramelly, largely thanks to the fact they’re made with rice milk. Moo Free Easter eggs are a great option for vegan families because they’re extremely child friendly – and they’re organic, too. We tried the Cheeky Orange Egg (£3.99) and the Sea Salt & Caramel Egg (£5.99). We preferred the Cheeky Orange – milky, sweet chocolate infused with orange – to the Sea Salt & Caramel, which tasted a little synthetic. Divine wins our vote for originality. The brand’s Easter egg range this year includes a Pink Himalayan Salt Egg (£5.25); a Gourmet Popcorn Egg (£10); and a Raisin, Spice & Hot Cross Bun chocolate bar (£2.39) – yes, you read that correctly. We dove straight into the vegan (60% dark) Himalayan Salt Egg but found the salt aspect virtually nonexistent in both taste and appearance. The concept could have been delivered far more playfully with, say, a scattering of the pink salt across the shell. The Raisin, Spice & Hot Cross Bun chocolate bar, on the other hand, was an explosion of full-bodied flavour, out of which the cinnamon was most dominant. (The same bar could, in fact, be brought back at Christmas under a new, festive name.) The Gourmet Popcorn Egg stole the show, though, with its Joe & Sephs Salted Caramel Popcorn encased in a milk chocolate egg shell. One team member described it as the ‘blockbuster hit of this year’s Easter eggs’. The most exotic Easter egg we sampled was Daylesford’s Dairy-free Lemon & Sea Salt Egg with Cornflower Petals. The egg came prettily decorated with dried cornflower petals, and both the lemon and salt flavourings came through vividly. In fact, the egg was so full of flavour some found it verging on pungent, but all agreed you could taste the quality. Rococo’s Easter eggs grew on us. When tasting the Dark Sea Salt Egg with Salted Caramel Truffles (£30) amid lighter, creamier offerings from other brands we found it overpowering and in need of more salt to combat the richness of the dark chocolate. Similarly with the Milk Honeycomb Egg (£30), the accompanying thick slabs of chocolate-coated honeycomb tasted sickly, while the portions seemed oversized. Well, how wrong we were. Returning to the same eggs later in the day, we fully appreciated the former but fell in love with the latter, enthusing en masse over the honeycomb dotted through the egg shell. Do indulge in Rococo’s Easter eggs, just don’t attempt to eat them with a side of yet more chocolate. Pierre Hermé has a range of elegant looking Easter eggs this year, many of which have been created to resemble a gourmet rendering of the MOOD, designed by the renowned French silversmith Christofle. Admittedly, we only tried the mini eggs (£7). These were tasty but didn’t stand out from other mini eggs we sampled, many of which had prettier shells and more interesting fillings. Harvey Nichols is shaking up its Easter range this year. Going beyond the standard egg-shaped offering, the luxury department store presents a Chocolate Fried Egg on Toast, a creation which comes by way of Bath chocolatiers Choc on Choc. We tried the Sunny Side Up on Brown (£8.95). It looked the part – the aero texture of the milk chocolate standing in for toast – and, together with the white chocolate fried egg, made for a fun alternative to a standard Easter egg. We also tried Vera the Vegan Easter hen, supplied to Harvey Nichols by Chococo, which won marks for appearance – Vera the hen came astride a scattering of cocoa bean ‘eggs’ – but tasted a little bitter, making Vera one for the virtuous chocolate eater. Our verdict? Change up the Easter eggs you buy this year. Impress your giftees with chocolate shaped as something other than a standard egg, or search for one with a surprise element, such as a hidden drawer of truffles. And if you only buy one Easter egg? Make it Hotel Chocolat’s ‘You Crack Me Up’ egg for smiles all round and an egg that tastes as exquisite as it looks. Beyond that? Stick to one egg per person to avoid Easter chocolate fatigue and above all, don’t attempt an Easter egg taste test at home – no one in the Culture Whisper office will be looking at chocolate again for a long, long time.